BOOM! Studios is proud to announce Royden Lepp’s RUST VOL. 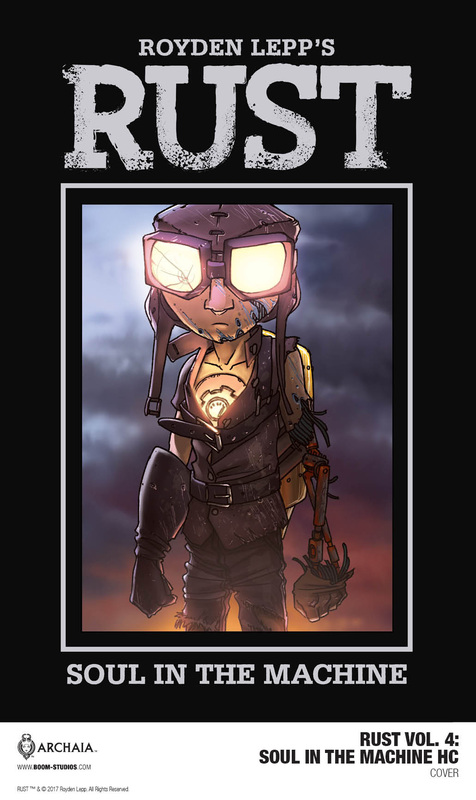 4: SOUL IN THE MACHINE, the final chapter to his critically acclaimed graphic novel series about a mysterious boy who suddenly appears on a farm struggling to survive after a long apocalyptic war and changes the fate of the family who runs it. Debuting in February 2018, this original graphic novel marks the first time the publisher has released both hardcover and softcover editions simultaneously in comic shops and bookstores. At the center of the Rust saga is Jet Jones, a boy with a jetpack who crashes into the Taylor family farm. As Jet deals with his uncertain future, members of the Taylor family each view his arrival—and subsequent stay—in different ways. Developed over the last seven years, Rust is a deeply personal story that echoes Lepp’s own history—in particular, the eldest son, Roman, who grapples with the loss of his father, who went missing during the war. The previous volumes of this acclaimed graphic novel series—Rust Vol 1: Visitor in the Field, Rust Vol. 2: Secrets of the Cell, and Rust Vol. 3: Death of the Rocket Boy—are all available in hardcover, softcover, and digital format. An additional release, the Rust Vol. 0: The Boy Soldier softcover, collects the prologues of all four hardcover volumes. RUST VOL. 4: SOUL IN THE MACHINE is the latest release from BOOM! Studios’ critically acclaimed Archaia imprint, home to graphic novels such as Mouse Guard by David Petersen; Cursed Pirate Girl by Jeremy Bastian; Bolivar by Sean Rubin; Jane by Aline Brosh McKenna and Ramón Pérez; and licensed series like Jim Henson’s The Power of the Dark Crystal and Jim Henson’s Labyrinth. RUST VOL. 4: SOUL IN THE MACHINE features a cover by Royden Lepp. Print copies will be available for sale at local comic book shops (use comicshoplocator.com to find the nearest one); booksellers including Amazon, Barnes & Noble, and Books-A-Million; or through the BOOM! Studios webstore. Digital copies can be purchased from content providers, including comiXology, iBooks, Google Play, and the BOOM! Studios app. For continuing news on RUST VOL. 4: SOUL IN THE MACHINE and more from BOOM! Studios, stay tuned to www.boom-studios.com and follow @boomstudios on Twitter.